AIB, proud sponsors of both Club and County, along with AXA, exclusive underwriters of AIB’s insurance presented The Jack and Jill Children’s Foundation with a cheque for €11,050 at AIB Bankcentre. The donation will provide over 680 home nursing hours for children under the age of five who have a significant neurodevelopmental delay involving severe learning difficulties, all across Ireland. Support is also offered by Jack and Jill to all families whose child is at End of Life regardless of their diagnosis. 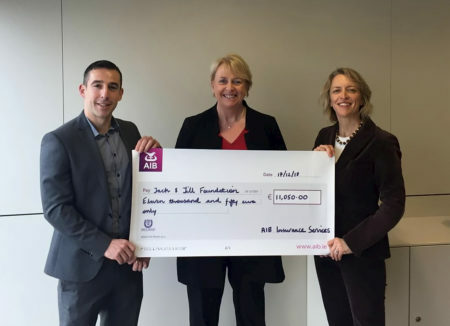 Since the foundation began in 1997, The Jack and Jill Foundation have helped 282 children in Cork, and AIB’s donation will continue to support children in the county. The funds are a surplus from the AIB GAA Home Insurance Offering that will now go to support the Jack and Jill Children’s Foundation. The AIB GAA Home Insurance Offering saw AIB pay €50 to a member or supporter of any GAA club nationwide when he or she purchased a new home insurance policy. The offer ran from October 2016 to October 2018, with an overall investment of €140,000 from AIB funds into grassroots clubs, as well as 12 clubs benefitting from a €1,000 voucher for jerseys. 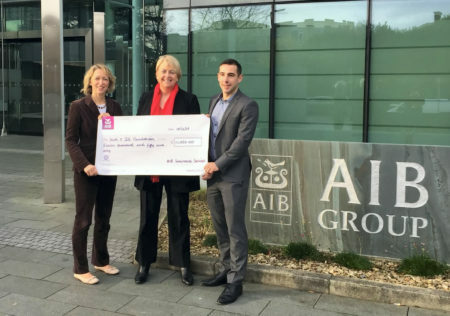 As it’s Christmas time, AIB, with help from AXA, decided to donate the remaining surplus of funds to Jack and Jill and are honoured to be in a position to support such a worthy charity. Helen Carberry, AIB Head of Resources, Investments & Insurance, was on-site to present the cheque to Carmel Doyle, The Jack and Jill Children’s Foundation Interim CEO. For exclusive content and to see how AIB are Backing Club and County, follow AIB GAA on Facebook, Twitter, Instagram and Snapchat.